The people of Nowa Huta longed for some kind of religious presence and for decades pleaded with the communist government for permission to build a church. Nowa Huta (pronounced Nova WHO-ta), was meant to be the perfect communist city— a model for the great communist society spreading across Eastern Europe. Built by the Soviets following the devastation of the second World War, Nowa Huta (meaning, “New Steel Mill”) is located just outside of Kraków, Poland. Of course, following communism’s atheistic ideology, a church of any kind was never part of the plan for this model communist city. Nevertheless, the people themselves longed for some kind of religious presence and for decades pleaded with the communist government for permission to build a church. In the late 1980s, Seventh-day Adventists were given the opportunity to reach the people of Nowa Huta, and following the collapse of communism in Poland in 1989, religious activities were more widespread. One day in 1992, Agnieszka (pronounced Ag-NESH-ka), a young woman in her early twenties, noticed a poster on a city tram advertising lectures on vegetarianism and health, along with some religious presentations. Having always been reluctant to eat meat, Agnieszka decided to attend. In the same year, a Seventh-day Adventist church was officially organized in Nowa Huta. While she enjoyed the vegetarian cooking and health demonstrations, Agnieszka wasn’t as excited about the Bible presentations. When Bible study interest cards were handed out, Agnieszka tore up the card. But Agnieszka enjoyed the health topics so much that she kept attending the Adventist-sponsored program, and soon her heart warmed to the Bible lessons. After the fourth presentation she picked up a Bible study card for herself! At the end of the meetings, Agnieszka decided to be baptized. Although her parents were Catholic, they reacted positively to Agnieszka’s decision to join the Seventh-day Adventist Church. 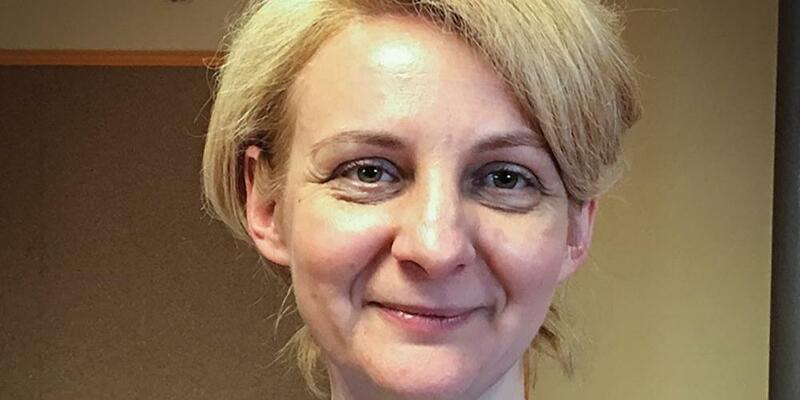 Today Agnieszka works in the Secretariat office of the South Polish Conference and is a Sabbath School teacher at the Central Adventist Church in Krakow. “Very often I use the short clips from Adventist Mission’s Mission Spotlight when people share testimonies,” she says. In addition, Agnieszka enjoys watching Hope Channel Poland and is a regular viewer of Hope Sabbath School. While she appreciates the current programming, she is delighted that Hope Channel Poland has been designated to receive part of this quarter’s Thirteenth Sabbath Offering for a new studio. “I’m very happy about this opportunity,” she says. “This means that we’ll have more programs that are prepared not as adaptations from elsewhere, but [programs] by Poles and for Poles.” She also envisions using Hope Channel Poland as a way to invite people to attend local Adventist programs and concerts. Adventist media outreach in Poland began in 1980 when the church signed an agreement with the Polish government for radio programming. “We prepared the broadcasts, but they were aired by Adventist World Radio (AWR) from Lisbon, Portugal,” says Jan (pronounced “Yon”) Kot, programming director of Hope Channel Poland. In those days, everything had to pass through government censorship before being sent to AWR. Only if the censors stamped their approval was the program allowed to air. And then YouTube appeared, and the Voice of Hope team (as it was then known) began posting video programs on YouTube. Today, with the possibility of live streaming over the internet, much more is possible. “Today we have 100 to 150 hours of premier programming a year and on YouTube we have more than 1 million views,” says Jan. “And we use Facebook, to help advertise our programs. Every month people from around 50 countries visit our Facebook page. Many Poles lives in different parts of the world,” he adds. As Hope Channel Poland expands, they still work in a very small area of the Polish Union Conference building in Warsaw. They are ready to feature more Polish programming and are in need of a studio. Thank you for your generous support of this important project.